Yikes, it’s Saturday, not Friday. 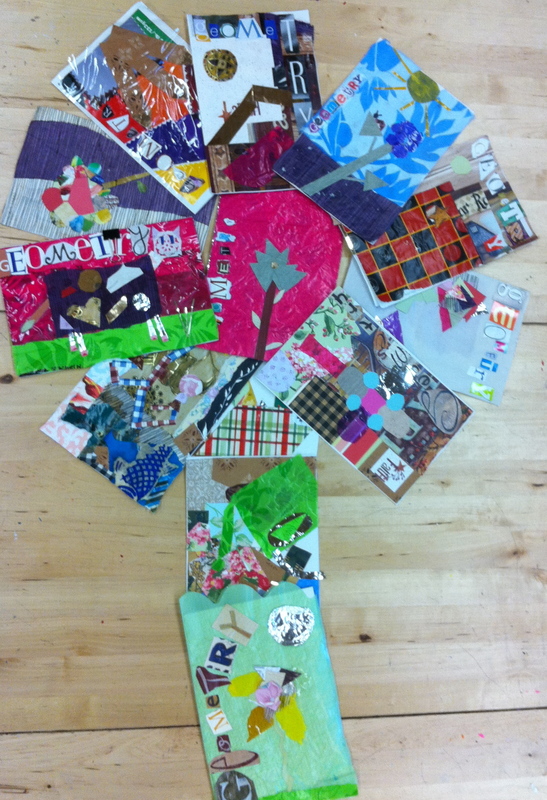 I was so energized after a after a FABULOUS week of teaching and I couldn’t wait to blog. I really meant to post last night,but I just didn’t have it in me! So, here is my favorite Friday – on Saturday! 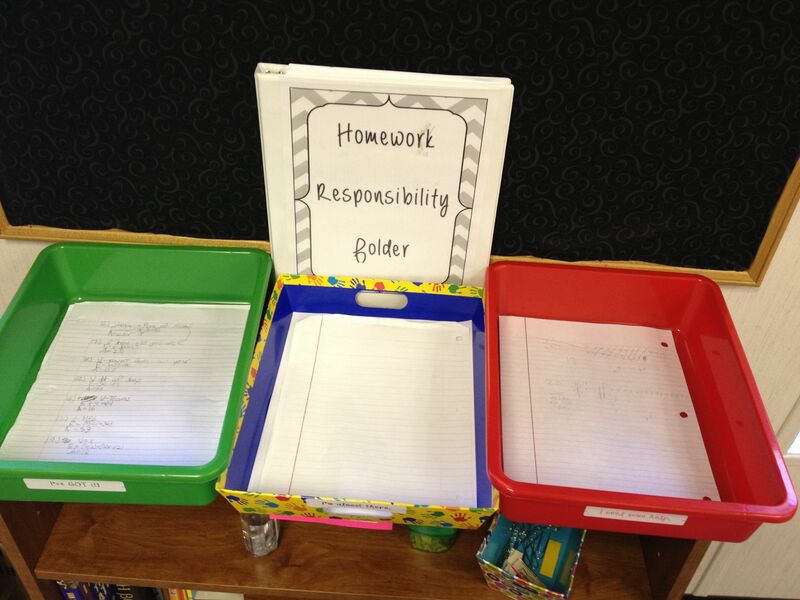 This week my “No Homework Responsibility Binder” blew me AWAY. I have kids turning in late homework right and left. Last year, when they didn’t do homework, they took their zero and moved on. This year, they are doing it – even if it is a week later! I believe that it is the format of the binder and the new incentive that I have offered for making up their missed homework. I only check homework for completion. At the end of the grading period, they have a homework completion grade that is equal to one test grade (50 points in my class). Every time they do not have their homework, they lose 2 points. It can add up (or rather, subtracts) pretty fast. This year since I am not tracking missed homework (the binder does that for me) I am freed up to offer an incentive. WHEN they make up their homework they get half credit back. It’s working like a dream and almost every student has made up every homework assignment so far this year. I’m in heaven. I love my green, yellow, and red baskets (thanks @fouss) where students turn in EVERY paper and assessment! They put their paper in the green basket when they felt they understood it well, the yellow basket is so-so, and the red basket is my “SOS – HELP ME I’m lost” basket. If kids turn in a paper to the yellow basket but do very well, I always put a “Go Green”! on their paper. I want them to be confident in their math abilities! My other favorite this week is MONSTER EQUATIONS. The kids can’t get enough of them. I love their monsters! When we moved to x/2 = 3 this week we got to draw HALF of a monster. How much fun is that? Then I got to say, “If HALF a monster can eat 3 people, how much could an ENTIRE MONSTER EAT.” (** Note, I am also modeling this on the balance scale and then writing out the steps. **) It really makes equation solving fun. A student even made me three adorable monsters (with google eyes and everythign) and brought them to me Friday. I meant to take a picture and post it, but forgot. I will though – they are so cute! This week’s theme is Homework Policy. 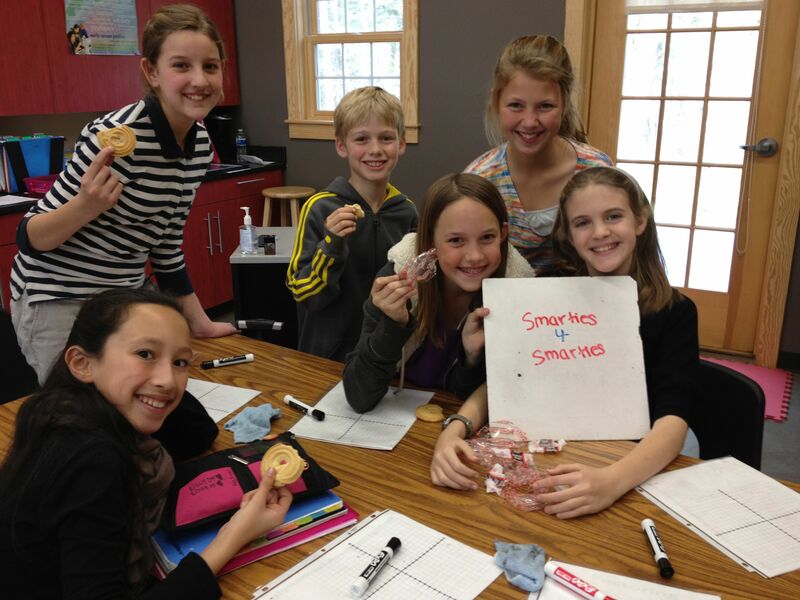 Next week, the theme will be “Favorite Math Class Games”. Kevin, @bt2bn, Homework – what is it and what do you do with it? The homework discussion came up over and over at #TMC12. No one is totally happy with their system, but here were some common themes. We were all more concerned that students attempted the problems. Several of us give the students the answers when assigning homework. I’m in this category. I like them to check their answers as they work so they know when if they are doing it correctly. It also allows me to tell them that I all already know the answer, I want to see HOW they came up with that answer. As they already have the answers, I do not grade homework. I just check it for completion as they are doing a “bell ringer” activity. For their grade, I start them out with 50 points at the beginning of the trimester and dock then two points everytime they miss an assignment. For most kids, this is a real grade booster as 50 points is equivalent to a test grade in my class. Last year, I saw an amazing Student Responsibility Card on Hedge’s blog. I totally stole it, but but made it into a half page to save paper and made it YELLOW. Then, I had students fill out this yellow slip when they didn’t do their homework. This was a great idea, as I never had to “record” who didn’t do their homework. I just collected the yellow sheets and then recorded it at the end of the trimester. This took almost no time and was a record, in their own handwriting, of who had not done their work. The biggest problem was that I just stacked these in a pile and didn’t really look at them until the end of the trimester. So, unless a student was very obvious (no homework several times in a week), I missed accumulating homework incompletion. My second problem was that I thought that filling out yellow sheets would thwart most of my errant homework kids, but it did not. Seventh graders can be quite persistent, and homework incompletion was no exception. In a discussion with Sean Sweeny at the airport (yes, we were all still talking math right up until we got on the plane), he told me that if one of his students doesn’t do their homework they have to stay after school or to do a study hall to make it up. I believe he said that this was a school wide policy. Sean said that this was pretty effective in getting the kids to do homework on the night it was assigned. They knew they had to do it anyway, and no one wants to sit after school doing homework. So, his students were pretty good about doing their homework. This year I would like to do something similar, but more organized. And, I would like to make the students more accountable for completion of their homework. My fabulous director always says that if we are assigning homework, then it should be important enough for every student to complete. After seeing this great idea on Pinterest from Leslie at Jack of all Trades, I made a no homework binder. I call it a “Responsibility Binder”. I still want students to fill out a sheet when they don’t do their homework. It was so valuable to see their reason WHY they didn’t do their homework in their own words. But instead of loose half sheets, it will be organized alphabetically in a binder. Another improvement is going to be the addition of a “date completed” column on this sheet. I want to give the students ownership over completing their homework. Even if students don’t do their homework initially, they will still be required to complete it. And this should be an easy way to have the student keep track of it. If they don’t complete two or three in a row, I’ll intervene. There has been much discussion on Twitter about having an electronic GDoc Form that students filled out when they did not do their homework. I really liked this but I can’t make it work because I want students to go back and fill in the date when the homework is completed. I don’t want them to have access to the GDoc as they could change it, or get confused about which column to write it in. I could have them fill out another GDoc when they complete their homework but I’m afraid they won’t be able to keep up with this. I am thinking that a hard copy record in a binder is going to work best for me right now. I am still working on this in my mind however because I do love all things electronic. Here is my proposed sheet. I would love any suggestions! Read other #made4math posts here! I used to keep a plan book. It was ok. But, I never actually wrote my plans in it bc those squares were too small. I just wrote down the lesson title and the homework assignment. As I got busy, I would often forget to write things down it in. Especially when I made changes in assignments. The plan book was one more thing to keep up with and drag back and forth to school every day. The idea was to use the plan book for the next year as a guide. But I did not refer to it as often as I should have (only about once a unit) because then I would have to take TWO plan books (one for last year and this year) home every night. Now, I’m all electronic when I plan. I made a Google Spreadsheet that lists the date, lesson, homework, and any important links the students will need. I love this way of giving homework, because then students can easily find the links I want them to access. 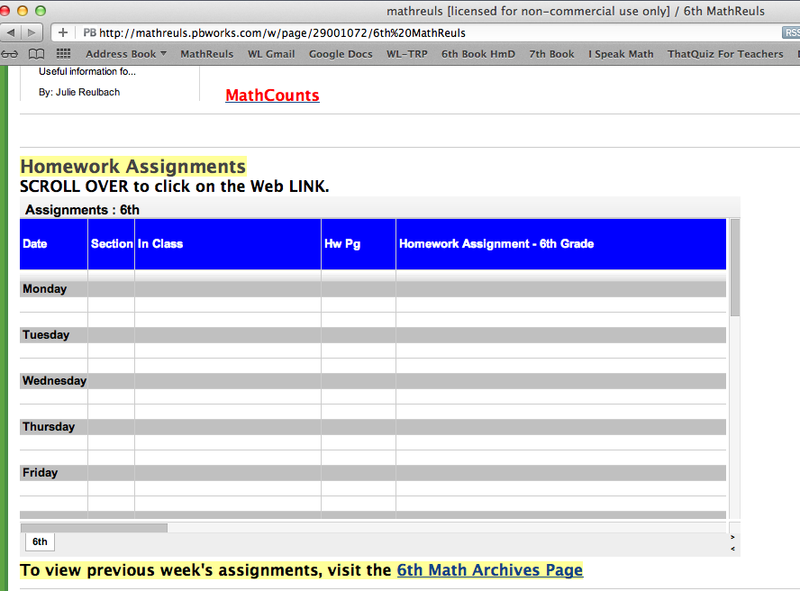 At the bottom, I provide a “6th Math Archives Page” link so absent students can refer back to the previous week(s). To make things easier for me when updating and going to a new week, I have two separate tabs in the GDoc spreadsheet. One is the current week and the other is the archive page. I put the current week’s assignments into the 6th and 7th tabs. These are the tabs that I had embedded into the class wiki. 6th 2011 is the entire year and it is what I use for the archives. I start a new tab for each year (you can see the 6th 2010 and the 7th 2010 from two years ago). This way I have a record of multiple years of plans and homework all in one place. Read about other teacher’s Favorite Fridays here! 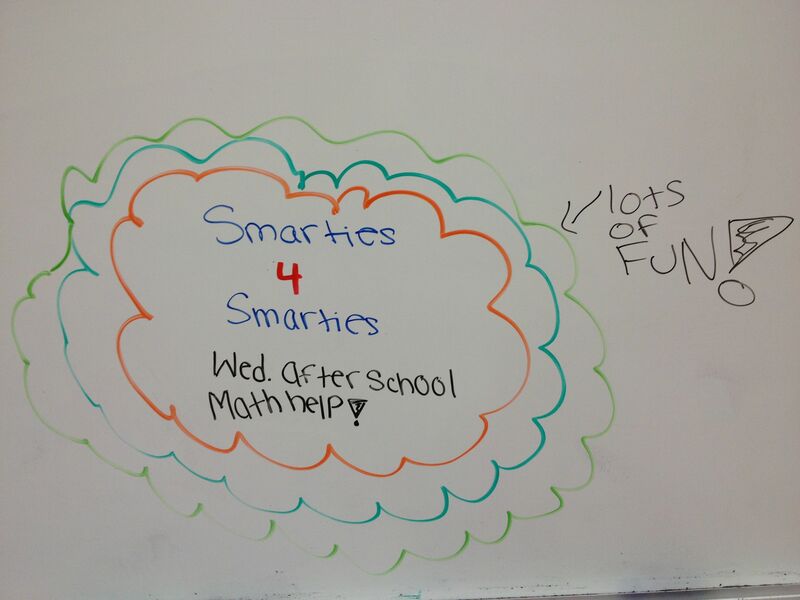 Once a week I offer after school math help for each subject. After school math help is great because it’s a small group so I can focus on exactly what each student needs. Students come to after school help if they have been absent and want to catch up (very needed in winter months), If they would like help on the current topic, or if they would like to do their homework with me. After school help today was FUN, the students were awesome, and I’m really looking forward to spending more Wednesdays with my amazing 6th grade Smarties. Assigning odds allows the students to check to see if they have the correct answer to every single problem that they attempt. This is important because I do not want them practicing 10 homework problems incorrectly. If they do the first problem and see that they have it correct, they gain encouragement and confidently move on to the next problem. If they do the first problem and then see that it is incorrect, they know they did something wrong. Hopefully they will not continue to do the remainder of the homework incorrectly. A student that does an entire homework assignment incorrectly has not only gained nothing, but they have committed incorrect practices to memory. My hope is that once they discover a problem is done incorrectly, they will research how to do it right. They can read their book, look back into notes, search the net, call a friend, ask a parent, or email me. I would rather a student not do the homework than do 10 problems incorrectly. I will look at the students’ homework each day. I am not looking for the correct answers because they already have these. I am looking for the correct procedures. I want to make sure they each know how to get the correct answer. I believe that homework should be practice. But for homework to be productive practice, students need to do homework correctly. This means having the answers to all of their homework problems while they are working them. I analyzed the homework survey results from Sam’s blog. He asked teachers a series of questions about their homework polices. What I was most interested in how teachers were grading and if they were happy. 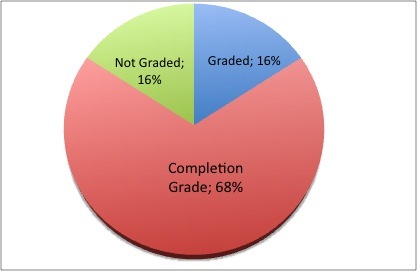 Sixty-eight percent of teachers that answered the survey are grading homework for completion only. 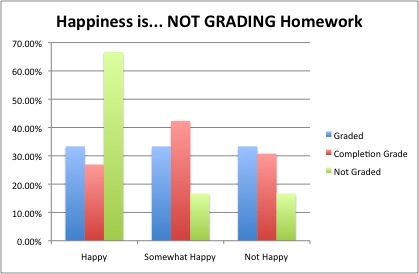 Teachers who are the happiest with their homework procedures are NOT grading homework, not even for completion. I was thrilled by this result. Forget the fact that I am going to be a happier person if I do not have to spend many hours grading homework. Apparently I will also be happier with my homework system if I do not grade homework. This is classic win-win. Numbers. Sam received 40 responses, which satisfies the minimum number required needed to perform statistical calculations. However, I did not run the numbers through any tests, I just analyzed the resulting percentages, quick and dirty. Subjectivity. As the responses were open-ended response, I had to use my judgment in categorizing the responses regarding happiness. I used a scale from 1 – 3. With 1 being very forms of not happy (i.e. – dislike, hate it), 2 being somewhat happy, and 3 being happy or very happy. I pulled these ideas from the teachers comments in the survey and my own thoughts. Specific quotes from the actual survey are at the end. Many of the ideas here came from and are presented on the Math Teacher Wiki Homework page. Exit Card – One problem each day at end of lesson to be quickly graded, then can base hw off of that (maybe the hw levels)? Law of Diminishing returns – don’t kill em with homework. A Duke Study cites a “10 minute per grade level” rule that my school lives by. I love it. What is the motivation to do homework? Homework is the definition of anti-climatic. It comes at the very end and doesn’t play into the story at all. The lesson is finished, the homework is independent, it won’t even be “really” graded, and tomorrow we will be talking about something entirely different. Why would students care about homework? Because we force them? Because we are going to give them a bad grade? Because we are going to call their parents? Because they are going to be “embarrassed” that they did not do it? These are not motivators – these are threats. These threats are what lead students to do a poor, sloppy job on homework, the period before it is due, half-copying from their classmates. In order to change the effectiveness of homework assignments, we need to change how these assignments work. We need to make homework relevant, not only to the lesson of the past, but also to the lesson of the next day, if possible. Can we make it practice of the current day, and the topic of the next day? If this is too hard to accomplish, then what CAN we do to motivate students to do homework? What can we do to make homework important to students, to make it relevant, and most importantly, to make them want to do it well? Student homework is my Achilles Heel, my fatal flaw as a teacher, my nemesis. The only thing I am worse at in teaching is taking daily attendance. Some math teachers do not give or are doing away with homework. I am not sure how I feel about this yet. I feel that mathematics is a building skill, like a musical instrument, or a sport. The more time you spend practicing the better you will become. But, that practice has to be done well to be effective. Also, I don’t feel that you need a large amount of practice, just a little bit every day. Since most students have math class five days a week, is this enough practice? Do students get enough practice by doing mathematics each day in class? Many times I have seen students really feel like they “have it” in class, only to get home and have trouble doing it independently. I worked as a research director in television advertising for a while. The rule of thumb there was “Frequency of 3”. This meant that the consumer had to be exposed to the advertisement at least three different times in order for it to be effective. There was NO WAY any customer was buying ad spots where they were getting less than a frequency of three. The sales people didn’t even pitch it. Even the noobs knew this. I think about this every time I consider throwing out homework. I worry – is once in class enough, even if it IS independent practice? Because, it is only ONE event, not three. Going over homework questions. Students are either in two camps here – either I didn’t explain it enough or I am killing them explaining it too much. Students can take more ownership of their mathematics learning. Fortunately, some wonderful teachers ( McTownsley and Shah )have gotten a big jump on me, and I can’t wait to learn more from their ideas! Motivating students to really DO the homework effectively. Assign reading and a few problems of the next section to get the students thinking. I would like the students to do homework and then I will check it, but not grade it. I feel that the student wants to be acknowledged for their effort, and am hoping that just checking it but not grading it will give them the external praise that they like. As I plan on giving them all of the answers AS I give them the homework, I feel that grading is pretty pointless anyway. I would love to develop a hw system that works for most and can easily be adapted for all. I know that I am dreaming here. But, if I can’t figure out why this is so hard to do, then it should be doable! Luckily, I have amazing math teacher tweeps who are hard at work on this with me as well over at the Math Wiki. We plan on sharing ideas then building something together, or at least that is my plan! Please join us over there and add your ideas and methodology. It is a public wiki party and everyone’s invited!